Dinners get a lot of attention, don't they? It's all about the dinner. What are you making for dinner? What are we having for dinner? Quick and easy dinner recipes are sought after. And I get it, I'm there with you. I'm always searching for new ways to make quick, easy, and nutritious dinners for those weeknights after a long day of work. But breakfast and lunch need a little attention to. Who eats a good breakfast every morning? I know no one is whipping up a well-balanced breakfast at 6am before your way into work. If you are, I applaud you and you deserve a medal. I think most of us hit the coffee first, then maybe search for a bagel or a packaged granola bar. Yogurt is a good idea, but I've always needed something solid to get me going in the morning and for me yogurt is more of a mid-morning hold-me-over-til-lunch snack. So, if you're needing an energy-packed quick and easy breakfast that you can eat in the car or bring to work and eat at your desk, breakfast energy bites are for you. I'm obsessed with dark chocolate bars and chopping them up for recipes. I love the variations in sizes and the dark chocolate flavor is so rich it helps to town down any sweetness. These dark chocolate almond butter energy bites are everything you need to get you out the door in the morning. Ground flaxseed, chia seeds, almond butter, and did I mention dark chocolate chunks? The ground flaxseed almost takes on a cinnamon-like flavor it was so warm and was the perfect match for the richness of the chocolate. Make these on Sunday and you'll have your grab-and-go breakfasts for the week! A note about the recipe, you can buy ground flaxseed or do it yourself. I preferred to buy the seeds and put them in my Nutribullet to create the powder. Dark Chocolate Almond Butter Energy Bites are a quick and easy breakfast or morning snack with coffee. Packed with energy rich flaxseed and chia seeds these are so easy you'll want to make these every week! 1. Combine the oats, almond butter, vanilla, and honey. Stir in the ground flaxseed and chia seeds. Lastly, stir in the chopped chocolate. Place in the fridge for 15 minutes. 2. Once chilled, remove from the fridge and roll into balls. Towards the end it might get a little sticky as the warmth from your hands warms the mixture. If you need to, pop the bowl back in the fridge for a few minutes and then finish up rolling the last of the bites. I like to keep these in the fridge, the coolness is refreshing and the chocolate chunks get an extra crispiness. 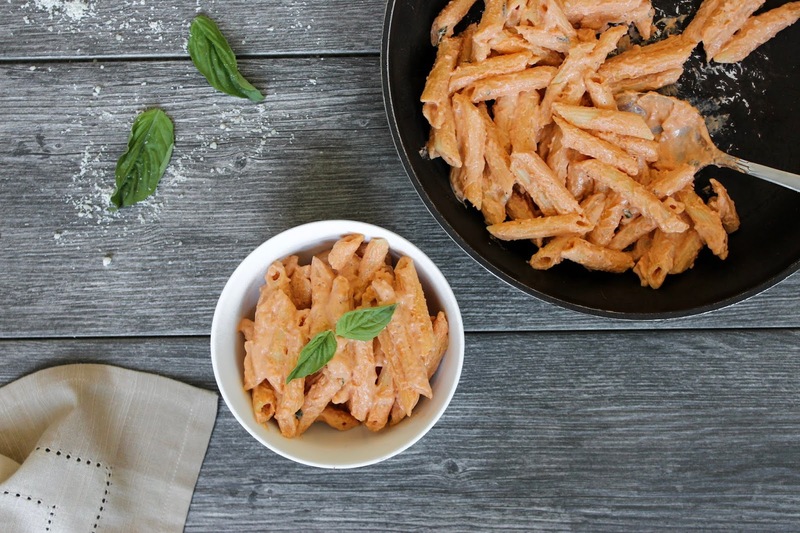 Penne alla Vodka is the perfect weeknight dinner. The sauce comes together in the time it takes to cook the pasta and in less than 30 minutes you have a bursting with flavor pasta dinner on the table. A home cooked dinner in less than 30 minutes? Yes please! Let's face it. No one has the time or energy to whip up involved dinners every night. At the end of an exhausting work day I want to relax and unwind, but I also don't want to eat snacks for dinner or resort to ordering takeout...again. So meals like this really save the day. There's very little chopping, nothing too complicated, and it makes enough for leftovers. Eat this meat-free, or if you have a little extra time and energy on a weekend you can cook up some chicken and add that for a little extra heartiness. The vodka in the dish brings out the tomato flavor, the actual alcohol will cook off. However, if you prefer to remove the alcohol entirely you can absolutely do that. 1. Boil the pot of water and cook the pasta. 2. While the pasta is cooking, in a large pan melt the butter over medium-high heat. With a zester, zest in the garlic cloves and cook until lightly browned. Add the flour and whisk to form a paste. Turn heat to medium and add the light cream, tomato paste, vodka, and basil. Simmer for 8-10 minutes, then add the grated Parmesan cheese, salt, pepper, and garlic powder. At the very end, if sauce has thickened a bit too much add a small ladle of the boiling pasta water to thin out the sauce. Never add more cream, add the pasta water to thin out a sauce. 3. Drain the pasta and pour into the the sauce pan. This is my trick for only having to clean one pan, I always pour the pasta into the sauce pan and not dump the sauce into the pasta pot creating two dirty pots and pans. I also never dump ALL the pasta at once, I start with about half then keep adding until I have as much pasta as I want. Garnish each plate of pasta with a little extra Parmesan cheese. Serious question: is there anyone who doesn't love the taste of raw cookie dough? Come on, we all do it. Ya know, taste the cookie dough before we bake it? We totally push out of our minds that old salmonella risk thing for those sweet moments of raw cookie dough bliss. There's only been one time in my life when I've listened to that warning, and that's when I was pregnant with Lilly. But once she was born, right back to eating raw dough every time I was baking. But boy do I have a treat for you. A safe way to eat raw dough right here. Since these cookie dough truffles have no egg we can all indulge as much as we want without a single worry of a foodborne illness. I love...LOVED...the ones I topped with sea salt. It was the perfect combination of dark chocolate and salty. A note about the presentation of these, when you dip them in the melted dark chocolate and place them back in the fridge to harden you're going to get some chocolate that pools underneath each truffle. For photography purposes, I used my knife and broke those edges off but there's no reason why you have to do that...the more dark chocolate the better! These little guys would make the perfect addition to a party. Bring these as a dessert and watch them disappear! No bake cookie dough truffles are an easy and whimsical dessert. Now you can enjoy the taste we all love of raw cookie dough without the risk of eating raw dough. You can eat these plain, or top them with rainbow sprinkles or seat salt. Recipe below yielded 15 truffles. 1. Line a baking sheet with wax paper. In a bowl mix the butter, brown sugar, and vanilla. Slowly stir in the flour and white sugar and mix until it reaches cookie dough consistency. I've had to use my hands towards the end in a kneading fashion. Stir in the mini chocolate chips. Form into truffles and place them on the wax paper pan and freeze for 15 minutes. 2. Over a double boiler melt the 2 cups of dark chocolate. Once the chocolate has completely melted keep the flame on low as you begin to dip the truffles. Dip the frozen cookie dough truffles in the chocolate until completely covered then place back on the wax paper. The method that works for me is using a toothpick to spear the balls and dip into the chocolate and use a spoon to spoon the melty chocolate over top. Top with sprinkles, sea salt or leave plain. Place in the fridge until the chocolate has set. Ok total honesty here, I am totally not in the mood tonight to write a lot. So this is going to be short and sweet, but hey it's all about the recipe anyway, right? Mini pizzas are my go-to when I want a quick and easy dinner, but still something hot and homemade. While I love a fresh dough crust, premade crusts are such a convenient time-saver and dressed up the right way they can be quite good! I love that these crusts get extra crispy, nothing I hate more than a soft whimpy pizza crust. This pesto pizza is topped with diced cherry tomatoes which help add a lightness to the pesto cream sauce. Keep these ingredients on hand and next time you're "this close" to ordering take out, just whip up a few pesto pizzas! As noted in a previous recipe, the cooking times below are based on using mini pizza crusts. If you get fresh dough or a different crust you'll need to adjust the cooking times according to the package instructions. 2. In a large sauce pan over medium heat, melt the butter then whisk in the flour to form a roux. Pour in the light cream, then stir in the pesto sauce and Parmesan cheese. Simmer until slightly thickened. 3. To assemble to pizzas, spoon pesto sauce and spread leaving an edge for the crust. Top with a layer of Mozzarella cheese. Bake for 9 minutes, then broil on Hi for 1 minute to brown the top. 4. Garnish with as many diced cherry tomatoes as you like and a sprinkle of grated Parmesan. I like a lot, the cool taste adds a refreshing lightness to each bite. This is one of my favorite breakfast dishes. Herb Baked Eggs is probably the best way you can start a Saturday or Sunday morning. Pair these with some thick bacon and a flaky buttery biscuit and you'll be ready to take on the day. Something to note is that everyone likes their eggs a bit different. I personally like them nearly set with only a slight bit of runny yolk, while some people prefer them sunny-side up style with a super runny yolk. The cooking time below is going to yield you a firm yolk. Not your style? Adjust the cooking times a bit, and give them a check as their cooking to see how "done" the yolks are. When they've reached the style you like, take them out and enjoy! 1. Heat oven to 450. In a pie plate, place the cubed butter and the light cream. Bake for 5 minutes. 2. While the butter and cream are heating, crack the eggs into a bowl. Combine the garlic, thyme, parsley, rosemary, and Parmesan in a small bowl. 3. Pour the eggs into the heated butter and cream mix. Top with the Parmesan herb mix, season with salt and pepper. Bake for 7 minutes, then place under the broiler for 2 and 1/2 minutes. As noted above, if you want runny eggs adjust these times lower and keep checking them for your desired "doneness". I like firm eggs but if you like more of an over-easy you'll want to cook them a bit less. A long time ago, my first waitress job was at an IHOP. Yupp, that blue roof International House of Pancakes. I can still remember that identifiable smell of pancake batter and sticky syrup and the order of the syrups in the caddy on the table was Old Fashioned, Butter Pecan, Strawberry, and Blueberry. Now, this was way way back in about 2001 so they may have made some changes to their syrups. It's funny how certain things just stick with you through the years. Servers will agree with me, we remember the computer codes for menu items. When I turned 18 and was able to get a job at a restaurant that service liquor I started working at Macaroni Grill. I still write SPAG MEAT or FETT ALF if I'm making my home menu and it includes spaghetti and meatballs or fettuccine Alfredo. My favorite was for an amazingly delicious dish called the Penne Rustica, the code in the computer was CROCK. From my days working at a pancake house my palate has matured...a lot. I find myself searching for new flavors and savory dishes for breakfast. A few weeks ago I came across some recipes for Shakshuka, an amazing North African dish with onions, pepper, eggs and warm spices of cumin and paprika. Oh yea, this was definitely happening. I added a Spanish twist (can you blame me?) and this recipe below includes chorizo sausage and is topped with crumbled cotija cheese instead of feta. I also did a cooking hack and instead of cooking the eggs in the dish, I cooked them on the side and then added them to the top to serve. I'm telling you, I followed a recipe exactly the first time and I could NOT get my eggs to cook in the oven. So, I find for me it's easier and more predictable to cook my eggs on the side. You definitely need to eat this with sturdy bread or hearty biscuits. Trust me! The sauce is just begging to be soaked up and the best bite is topping your bread with a piece of chorizo, some pepper and onions, a little egg and a cool piece of cheese. Oh my. You're going to want this every weekend. I wonder if IHOP has Shakshuka on the menu now? Doubt it. 1. Mix together the cumin and paprika. In a large sauce pan over medium/ medium-high heat, cook the chorizo. I like to cook on one side for a few minutes, then flip and cook the other side a few minutes more. Then, using your spatula break up the links into small pieces, continue to cook until no longer pink inside. Once cooked, spoon into a bowl. 2. In the same pan, heat the EVOO over medium-high heat. Add the sliced onions and peppers. Spread them out into an even layer and let them cook, untouched about 5-6 minutes. Stir and repeat until all the onions and peppers are nicely dark and charred a bit. With a zester, zest in the garlic and cook an additional 30 seconds. Add the spice mixture and stir to coat the veggies. (Keep an eye on your heat, adjust down or up as needed). Now add the diced tomatoes and the sauce from the can and the cooked chorizo, reduce heat to low to simmer. Simmer for 10 minutes and taste, season with salt and pepper. 2. While the sauce is simmering, in another pan cook your eggs to your liking. Most Shakshuka is served with poached eggs, but I prefer mine about over-medium. It's up to you, although scrambled wouldn't work here. 3. To serve, plate a few spoonfuls of the tomato mixture, top with crumbled cotija cheese, and lastly the egg. Eat with sturdy crusty bread or fresh biscuits.